It seems more than fitting that my first blog post of 2013 should feature a book entitled 'The Last Post'. I like that kind of symmetry. 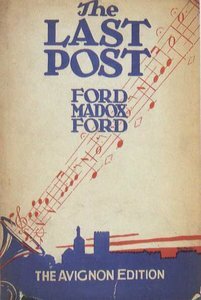 This, the final novel by Ford Madox Ford in the 'Parade's End' series, did not feature in the recent, lavish BBC/HBO television adaptation, starring Benedict Cumberbatch, which only added to my enjoyment when reading it. I can understand why it was omitted from the dramatisation, which was ultimately Christopher Tietjens's story, because this book follows a day in the life of Mark Teitjens, elder brother and heir to Groby. The story is set on a fine summer's day in June, significantly the same month that Christopher and Valentine met and took that unforgettable journey through the early morning fog. And here again, you could argue, we are surrounded by a deep fog, this time figuratively speaking, as the story is told mostly from Mark's point of view, who we can only gather, has had a stroke of some kind, suffered on armistice day, the very day that Christopher and Valentine finally came together as a couple. It is very difficult at first to figure out who is speaking and to what they are referring, making this the most Modernistic novel in the sequence. But perhaps Madox Ford does this intentionally. Perhaps he is trying to recreate the feeling of disorientation that a person who has suffered a stroke feels, making the reader experience a similar sense of bewilderment. The entire book could be read as clever analysis of what it is like to have suffered a stroke - or perhaps not? Mark lies on a bed in a wall-less hut, outdoor, day and night, being tended to as an invalid, mute and unable to communicate but by blinking. Why is Mark silent and motionless? He claims it is his decision, an act of defiance, but perhaps he is only fooling himself. He clearly has physical symptoms, such as sweating and having seizures, but Mark seems sure that it is his stubborn desire not to speak that prevents him from doing so. Either way, the reader lives inside his head, sees the arrival and departure of characters through his eyes and 'reads' his thoughts as they meander back into the past as he re-evaluates decisions made and moments past. This technique allows Madox Ford to return to earlier scenes in previous books, to explain characters' actions and revisit key moments. It is a delightful return journey for readers, yet painful too. The references to Christopher are all the more poignant because the character himself is missing from this, the final novel. He only appears briefly near the end of the novel, carrying sections of wood from Groby tree, telling his brother of its demise, looking every bit a defeated man. It seems wrong somehow. Yet, the author manages to bring all of the main characters from the series back together, in an orchestrated assault on Valentine and Christopher's rural home, as Sylvia attempts to destroy her husband's domestic bliss once and for all. Their son, young Michael, who now confusingly calls himself Mark, is there, as is General Campion, now Sylvia's paramour. Even Lady Macmaster is present, now a widow, come to sell her illicit love-letters to Christopher in an effort to gain access to her late husband's estate, which is bound-up in debt repayments to his old friend. And if it all sounds confusing, it is meant to, as Madox Ford creates a dramatic climax to the series of books, that borders on Shakespearean and slapstick all at once. Of course it is Sylvia who has plotted the entire scheme, in one last attempt to gain her husband's attention. But things do not go in her favour this time. Her character is shown at its worst - nothing is beneath her as she plots to destroy Valentine and Christopher, but ultimately she cannot bare the thought of hurting their child. Valentine's pregnancy is the source of great joy and concern for the reader, making our beloved suffragette a nervous wreck and a social pariah. Thankfully, it is Sylvia's Catholicism that comes home to roost as she faces the malevolence of her actions. In an ironic twist, considering how she used a child to trap Tietjens in the first place, it is the unborn- child, that causes Sylvia to check herself. 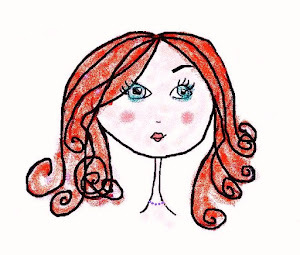 She is swamped by guilt and cannot leave the scene of domestic bliss quick enough. She will divorce Christopher, finally allowing him to marry again, her passion for revenge suddenly abated. The reader almost likes her at this point... but not quite. So, it may be possible that Valentine will go to Groby after all - once she has married Christopher, because Lady Tietjens, Mark's French mistress, now his wife, has agreed to live in the dower house, making the way clear for our beloved couple to take their place at Groby. It may not be probable, but it is left to the reader to decide. He might not live with her as Lady Groby, but he may finally live there with her as his wife. There is finally a way for them to live there together, without shaming the family name. It is heartbreaking to see Valentine chide her beloved over money It is awful too to hear how she has been reduced to a nervous wreck, having been badly treated by acquaintances, spending much of her time locked away in the house, for fear of meeting people. This is a terrible image of our fearless suffragette. Some have argued that Madox Ford, should have left Tietjens and Valentine on Armistice day. I, for one, am glad that he did not, because we learn that the couple are to have a child, that Sylvia will finally divorce her husband and that Valentine may live with Christopher in his beloved Groby. For that alone, I think it is worth it! Christopher has promised that he will take Mark's money if his furniture business does not go well, so it seems probable that his archaic principles are bending and they will not be without means for long. He has a child's welfare to think of now, and Valentine's mental state too. His duty to them far outweighs his outmoded Victorian codes of gentlemanly behaviour. It seems, that finally, there is a happy ending in sight. And so, 'The Last Post', while sounding the final battle cry of Sylvia Tietjens, actually heralds in a new beginning for Christopher and Valentine. What a happy thought to take with me into a new year, as I say a last goodbye to Tietjens, as he sits quietly with his Valentine, in a small cottage on a rising hill, the light sinking beyond the horizon, and birdsong echoing through the trees, clamouring to be heard. For me the happiest thought is Mark's last words to Valentine. He breaks his silence to tell her to never let their child suffer by hearing her speak crossly to her "good man." Valentine then tells the doctor that she needed those last words more than anyone, even Mark's wife. I see that as a new beginning, or a new covenant between them, alluded to in Mark's oblique reference to Noah's flood in his last words. How insightful Barbara. Yes, the ending is so touching. The Noah reference passed me by, so thank you for sharing. Thank you for this worthwhile analysis. At first, I hoped Ford ended his series with the fourth book, but reading the Last post again, it gives it a more realistic perspective. I also missed the Noah reference so thank you for pointing this out. Parade's end has become one of my favorite reads.